NEW DELHI — Since late last month, politicians in Sri Lanka have engaged in a war of words over who is the country’s rightful prime minister. On Thursday, their battle turned physical. 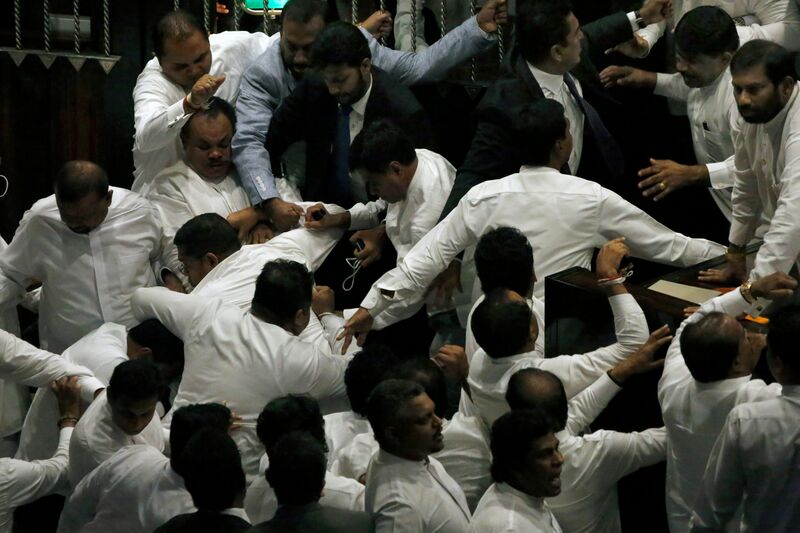 A scuffle broke out on the floor of Sri Lanka’s Parliament after the speaker attempted to call the body for a vote, the latest maneuver in a three-week-old power struggle that has pitted the country’s president, Maithripala Sirisena, against its sitting prime minister, Ranil Wickremesinghe. Lawmakers pushed and grabbed one another. One threw a garbage can at the speaker. Another clutched the speaker’s microphone and tried to take it away, injuring his hand in the process and requiring a trip to the hospital. The fight came as the turmoil in Sri Lanka reached a crucial stage. Sirisena first moved to oust Wickremesinghe as the prime minister on Oct. 26, replacing him with Mahinda Rajapaksa, a controversial former president. Sirisena then suspended Parliament, preventing it from holding any votes. Last week, when it became clear that his faction could not muster majority support in the chamber, Sirisena attempted to dissolve it altogether, a move blocked by Sri Lanka’s Supreme Court. On Wednesday, the Parliament finally reconvened, and in a chaotic voice vote, a majority of legislators rejected Rajapaksa as prime minister (they later presented a signed letter confirming their votes). But Sirisena refused to accept the vote as valid, saying lawmakers had not followed proper procedure. The result is a highly tense stalemate that has made it unclear who is in charge in Sri Lanka. After Thursday’s scuffle in Parliament, thousands of Wickremesinghe’s supporters took to the streets of Colombo, the nation’s capital. Harsha de Silva, a lawmaker in Wickremesinghe’s United National Party, said the crowds demonstrated that “we have power both inside and outside” the Parliament. He urged Rajapaksa to end his quest for the prime minister’s post. “Go for God’s sake Go!” he wrote on Twitter. Rajapaksa served as the country’s president for a decade and put a brutal end to Sri Lanka’s long-running civil war in 2009. He was ousted in 2015 and more recently has been maneuvering to return to power. On Thursday, he gave a speech in Parliament calling for fresh elections to resolve the crisis. “I suggest that we take this matter before the 15 million-plus voters in the country instead of trying to resolve this among the 225 persons sitting in this House,” said Rajapaksa. He accused the speaker of acting “hand in glove with certain Western embassies.” Not long after Rajapaksa stopped speaking, the pushing and shoving began. The Parliament is expected to reconvene Friday. Joanna Slater is the India bureau chief for The Washington Post. Prior to joining The Post, she was a foreign correspondent for the Globe & Mail in the United States and Europe and a reporter for the Wall Street Journal. Her previous postings include assignments in Mumbai, Hong Kong and Berlin.